Few companies contend with more heat related problems than do glass manufacturers. Control panels in close proximity to molten glass are particularly susceptible. High ambient temperatures caused constant "nuisance tripping" of the circuit breakers. The "quick fix" solution — opening the panel doors — allowed dirt to enter the panels and created a potential safety hazard. 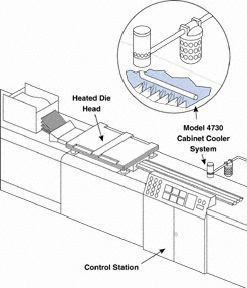 EXAIR Model 4330 Cabinet Coolers were installed on each electrical enclosure. Cold air was directed through the Cold Air Distribution Kit over the circuit breakers. Thermostat control assured that the Cabinet Coolers would activate only when internal temperatures approached critical levels. The panel doors were closed against dirt infiltration and shock hazard. Downtime was eliminated. The inherent reliability of the vortex tube operated Cabinet Cooler was the important advantage in this application. Because they have no moving parts, EXAIR Cabinet Coolers are virtually impervious to hostile environments. Glass plants, steel mills, foundries, and casting plants are just a few of the facilities benefiting from this simple, yet effective technology. In the pultrusion process, resin coated fibers are assembled by a forming guide, then drawn through a heated die. Residual heat from the die caused electronic malfunctions at the control station located immediately downstream. 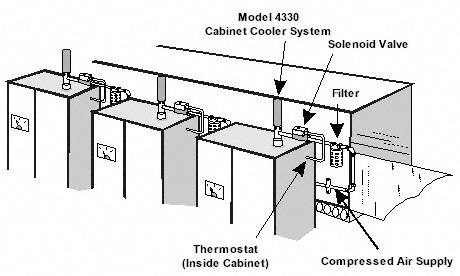 In minutes, a Model 4730 NEMA 4 Cabinet Cooler System was installed on the control module. Its 2,000 Btu/hr. (504 Kcal/hr.) cooling capacity more than offset the additional heat load produced by the die. Heat related malfunction and downtime were eliminated. The ability of EXAIR's Cabinet Cooler to maintain a slight positive pressure within the enclosure was an important additional benefit in this application. This purging feature assured that dust from the surroundings would not infiltrate the enclosure and compromise the sensitive electronic components. The Cabinet Cooler also maintained the NEMA 4 integrity.